Posh players celebrate Ivan Toney's goal at Sunderland earlier this season. The game is expected to attract the biggest attendance of the season with Sunderland expected to sell out their 4,200 allocation. Visiting fans have been allocated the entire Motorpoint Stand as well as part of the main stand. Posh have sold just under 3,000 tickets in addition to their 3,500 season ticket holders. Tickets are on sale at www.theposhtickets.com, via the Ticketmaster hotline 0844 847 1934 and in person at the ABAX Stadium Box Office. All wheelchair disabled spaces have sold out for this fixture. 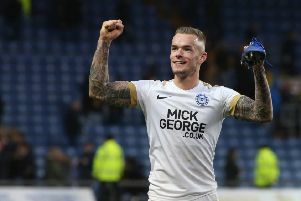 Posh are averaging crowds of 7,100 at League One home matches this season. Their highest attendance was 10,472 for the visit of Portsmouth in September.